Apart from the island of God, exactly located in the southeast part of Bali, there are three small islands named Nusa lembongan, Nusa Ceningan, and Nusa Penida. These three islands are pretty popular among divers who want to seek for Manta and Mola-Mola, known as sunfish which appears in particular season. If you are a non divers, do not worry, you still can relax and swim in the beach. Nusa Lembongan is the first island I started with. The second largest island among these three islands offers accommodation starting from guesthouses/homestays till the most luxurious villas and resorts. I was astonished upon my arrival in Nusa Lembongan. I quickly forgot the horrible sea-crossing, the wave was crazy, in addition of the boat’s speedboat. I saw some storeyed villas forming beautiful scenery and no doubt it looks luxurious. I always mention blue sea colour, but this one, it’s “bluer” than normal blue. 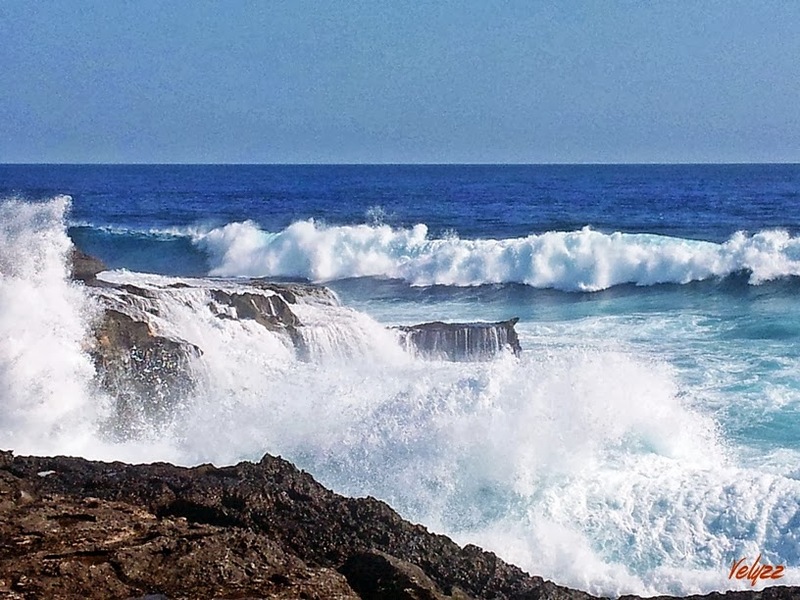 Although it is just a small island, Nusa Lembongan has turned to a touristic island. It’s very close and easy to cross from Sanur by fastboat. But still, there are some awesome places to visit. One of the popular beach in Nusa Lembongan is Dream Beach. You can swim in the infinity pool with spectacular seaview without staying at the resort by paying Rp 50,000. Not far from Dream Beach, a cliff point named Devil’s Tear may stunned you. Gigantic waves roll and crash the cliff create huge water splash. In some point, the crash will form beautiful waterfall on the cliff. Perfect place for photographers to catch this moment. You’ll understand why the named it Devil’s Tear after you come to this place. Let’s continue to its neighborhood, Nusa Ceningan, the smallest among those three islands. 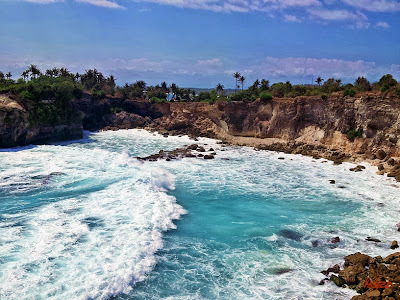 Nusa Ceningan can be reached just around 20 minutes by motorbike from Nusa Lembongan. A narrow bridge connecting both islands. The bridge is too small to be crossed by two motorbikes. The best part of Nusa Ceningan is the jumping point. This is the place if you want to test your adrenalin. If you want to do snorkeling, there are some snorkeling operators. I really wanted to do snorkeling in manta point but too bad the current is unsafe at that time so I couldn’t do snorkeling, too bad. From Sanur there are many fastboat operators every hour start from 7 a.m. The boat takes around 30 minutes to Jungut Batu cost Rp 50,000 for locals and for foreigners they normally charge Rp 75,000. Slow boat from Sanur cost Rp 35,000 but it takes 2 hours to reach Nusa Lembongan. Acommodation starts from Rp 200,000 in Nusa Lembongan. I stayed in Bunda 7 and it’s pretty nice and comfortable. The room was clean, there’s a small swimming pool also garden. Another popular guesthouse is Tarci Bungalow. Snorkeling to 2-3 spots cost Rp Rp 150,000-Rp 200,000/person including snorkeling gear.